You may not realize it, but one of the more common home maintenance issues is a clogged sewer line. 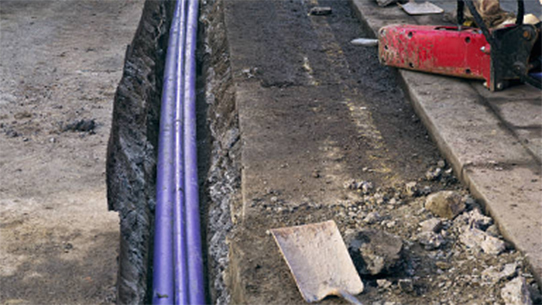 Unfortunately, sewer line repairs are for the most part expensive and complicated. The worse the clog gets the more expensive it is to fix. Now that is not to say that all sewer line repairs are expensive, if the problem is caught early it can be taken care of relatively cheaply. However, if the problem is allowed to hang around for a long time you might just have to consider replacing your sewer lines entirely. One of the telltale warning signs that there is a problem with the sewer line is the sudden appearance of damp areas or soggy pools either inside or outside your house. If inside, the most likely spot for these areas or pools to form is in the basement or on the ground floor. If outside, expect to see pools anywhere near where the sewer line runs underneath the property, and particularly in areas where there are large tree roots that appear to intersect with your underground sewer pipe network. You can be even more certain you are dealing with a potential sewer clog, crack or break if there is an unpleasant or musty odor coming from the damp or pooled areas. Odors may smell like sewage, or they may simply smell damp, grassy, cold, moldy or all of the above. If you also hear a sound like clanking or keys rattling, and if the sounds seem to reliably coincide with the use of the indoor plumbing (such as turning on the water in the sink or flushing the toilet), it is fairly safe to assume there is some kind of plumbing line leak at work. Contamination from raw sewage is a very real threat once these pools or soggy spots form, so be sure to use some kind of barrier or fence to keep kids and pets away from such areas until you can schedule a professional plumber to come out and make any necessary repairs. Indoor plumbing is a marvelous invention, except when it stops working properly. When this occurs, a small plumbing problem can turn into a major repair if not attended to rapidly. When drains start backing up, the first sign is typically standing water that is very slow to drain. This indicates there is some matter forming that may cause a later clog. Sometimes tree roots can also impact underground pipes to the point where there is a full clog or blockage instead of a break-through in the pipe, although most commonly roots cause a crack or break that begins leaking. If you see water that is draining slowly, this is the right time to contact your plumbing repair company before the matter gets worse and turns into a clog. Clogs can be caused by a wide variety of matter, including hair, sanitary products, baby wipes, diapers, cat litter and other material that can get easily bunched up to the point where it won’t fit down the sewer pipe. Your toilet in particular is a place where this can happen readily. If your toilet water level begins to change for no particular reason, the tank looks like it is “sweating,” or the bowl begins percolating like a coffee maker, these are also signs you should pay attention to. A quick call to your plumbing repair technician can ensure any potential blockages are removed quickly before they turn into a full-on clog. The third most common warning sign that you may need to make repairs to your sewer line is if your Beaverton area home begins to experience a number of different types of plumbing issues all at once or gradually over time. For example, if your toilet starts percolating and then your tub begins draining more and more slowly, there may be some kind of clog or impaction in this area of your sewer pipe network. Similarly, if you smell an unpleasant stench in your basement or on the ground floor and at the same time that your washing machine starts to overflow, this can indicate a problem with both a clog and a potential breach of the main sewer line (with a concurrent contamination risk). Experiencing multiple plumbing issues at once may point to a blockage or breach somewhere in the main sewer line or could even indicate an issue with the main sewer line in your city of Beaverton. The important thing is to take action right away to determine the source of the plumbing issue, identify who is responsible for repairs (you, the city or both), get the repairs made to avoid any dangerous health issues and ensure your home’s sewer line is safe and in proper working order for the future. By understanding these three reliable signs that can indicate your sewer line is in need of repair, you can move quickly to restore your home’s indoor plumbing to proper safe working order. The earlier you can spot the warning signs, the less risk your family will bear from potential contamination. In addition, catching a budding plumbing problem can go a long way towards controlling the repair costs. One of the best preventative measures you can take, regardless of whether your Beaverton home is new construction or a pre-owned home, is to schedule an annual plumbing inspection to ensure all your pipes are free from clogs, roots, rodents or other debris that could lead to a dangerous situation. By taking a proactive approach to sewer line maintenance, you lessen the chances of ever having to clean up contamination from sewage or foot the bill for a major repair.